Three days is enough time to see many of the top sights and some of the secondary sights of Paris—and make you eager for a return visit. Here's how to see the top sights in Paris, and get a real taste of Parisian life, in only three days (here are maps of Paris). Follow the itinerary for One Day in Paris: Arc de Triomphe, Avenue des Champs-Élysées, Rue du Faubourg St-Honoré, Palais d l'Élysée, Place de la Concorde, Jardin des Tuileries, Musée du Louvre, Île de la Cité, Cathédrale de Notre-Dame, Place St-Michel, the back streets of the Left Bank (Quartier Latin) and, if you choose, a cruise on the River Seine, followed by a very good dinner in a simple bistro or elegant restaurant. Go to the Île de la Cité for a look at the Towers of Notre-Dame, then to the Palais de Justice to admire the the splendid Sainte Chapelle and the gloomy Conciergerie, then explore the Latin Quarter and the Invalides before taking the Métro to the Trocadéro station for a walk downhill from the Palais de Chaillot to the Eiffel Tower and Champ-de-Mars. 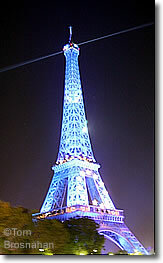 Go to Montmartre to see the Basilique du Sacré-Coeur and the artist-filled Place du Tertre. Choose a few more of Paris' excellent museums for visits. There are dozens. The one(s) you choose can be dictated by your own tastes, but we'd recommend the Musée d'Orsay, the Carnavalet (the museum of the history of Paris) and, depending upon the exhibitions, the displays in the Grand Palais or the Centre Georges Pompidou. Just as important, you'll have more time to spend people-watching in Parisian cafés, and in nice restaurants at dinnertime. 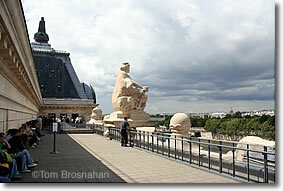 the terrace of the Musée d'Orsay.